“I greatly appreciate being asked to be part of President-elect Trump’s team and I will continue to enthusiastically support him and his agenda for American renewal,” the statement said. Crowley has come under fire in recent days after dozens of instances of plagiarism were revealed by Politico and CNN. In her 2000 Ph.D. dissertation for Columbia, Crowley swiped passages “primarily from six books and articles on U.S. foreign policy,” Politico reported earlier this month. CNN found that her 2012 book What the (Bleep) Just Happened? contained dozens of instances of plagiarism. HarperCollins responded to the reports by pulling sales of the book. 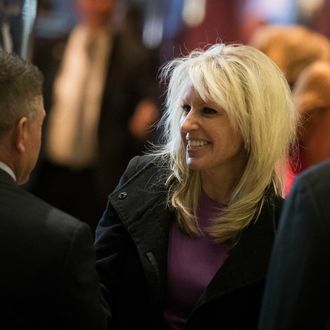 “The NSC will miss the opportunity to have Monica Crowley as part of our team,” incoming National Security Adviser Michael Flynn said in a statement. Now he’ll have to find another conspiracy-peddler to replace her.